Having served a traditional apprenticeship with Robert Thompson's Craftmen (The mouseman at Kilburn, York) Peter learnt the skill of fine furniture, carving and signwriting. All his work is done the traditional way, with hand tools, patience and a keen eye for perfection, that as well as keeping the old crafts alive, produces heirloom items to be cherished and used for many years to come. All of the wood Peter uses has been carefully selected to be free from defects and has been chosen to do the specific job intended. He generally works in Hardwoods for their superior durability, colour contrasts and figured grain. 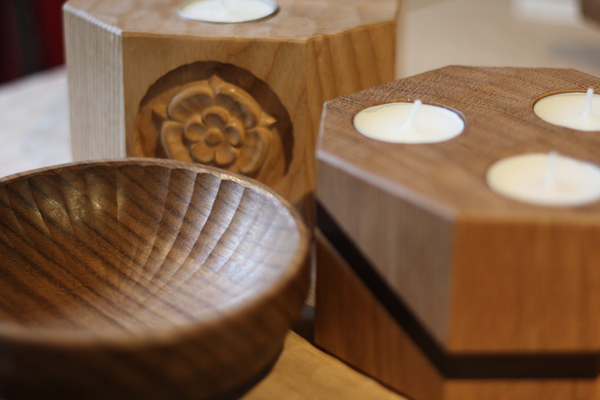 As well as the one off pieces sold in the gallery, Peter takes commissioned work, from craft items to furniture.